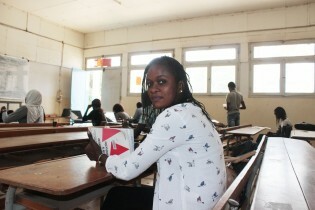 It is four o'clock in the afternoon in Senegal’s capital, Dakar, when pupils, students and workers begin to fill the municipal town halls of Grand Yoff and Sociocultural Centre Grand Médine to attend a unique community event - a film screening and a debate. Communities in Senegal's capital, Dakar, have been meeting across the city to watch a 45-minute documentary film made by returnee migrants, with support of the International Organization for Migration (IOM). Khoudia Ndiaye and Ndeye Fatou Sall set up a smartphone on a tripod to begin recording a video interview with Daro Thiam in Hann Bel-Air, a neighbourhood in Senegal’s capital Dakar. Hann Bel-Air is the departure point for many of the migrants who leave the city and country on irregular routes – boats to Spain, crossing the Sahara desert to the Mediterranean Sea, or to countries nearby. El Adama Diallo left his home in Senegal on Oct. 28, 2016, with dreams of reaching Europe in his heart and a steely determination that made him take an alternative, dangerous route to get there despite the absence of regular migration papers in his pocket. Migrants as Messengers is a peer-to-peer messaging campaign by the International Organization for Migration (IOM) where returning migrants share with their communities and families the dangers, trauma and abuse that many experienced while attempting irregular migration. When Senegalese president Macky Sall opened the 30MW Santhiou Mékhé solar plant last June, the country gained the title of having West Africa's largest such plant. But the distinction was short lived. Bouba Diop looks in delight at his uncle’s newly refurbished food canteen in the poor township of Keur Massar on the outskirts of the Senegalese capital Dakar. After years awaiting justice by a court of law, Chadian citizens packed the Palais de Justice in Dakar, Senegal, to catch a glimpse of Hissene Habre, president of the central African nation from 1982-1990 during which time his iron fist rule took between 1,200 and 40,000 lives, according to evidence compiled by Chadian and international rights groups. While the cement factories in Senegal are at war, ostensibly over the environmental impact one company will have on this West African nation, experts have cautioned that as the government plans to radically develop and industrialise the country, striking a balance between environmental protection and development will be key. Hundreds of students from Spain’s Canary Islands, Senegal and the Sahrawi refugee camps outside of Tindouf in western Algeria are meeting each other and breaking down cultural barriers thanks to the Red Educativa Sin Fronteras. Advocacy groups here are urging U.S. President Barack Obama to focus on more than just economic development during his upcoming trip to Africa. In Dakar, urban commuters are familiar with kids as young as five years old begging on street corners at all hours of the day or the night, with torn, dirty clothes, collecting donations in an empty tin can. Malian widow Mariama Sow, 30, and her three children are trying to find some semblance of normalcy in their lives in Dakar, Senegal, since they left the historic city of Timbuktu in northern Mali last June to escape the Islamist occupation. Congolese small-scale miner Elizabeth Tshimanga has made a successful living from prospecting. But like many artisanal miners in Africa, hers has been a long and tough journey marred by harassment and disputes over her legal status as a miner.